Monday, December 30th, 2013 | Author: Bunco Betty! A fun Bunco theme this time of year is New Year’s. We celebrated New Year’s Bunco in January. Our Bunco ladies wore sparkly shirts and heels, like many people do when they go to a party on New Years’s eve. A DVR recording of the ball drop was playing in the background. When people arrived they were given a necklace with a noisemaker attached to it and a Happy New Year tiara. You have to have a noisemaker (and a tiara) when the ball drops! As you probably know, most Bunco ladies love making noise! 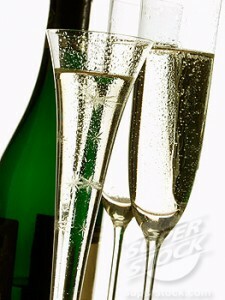 For drinks, we had sparkling cider and grape juice and Champagne for those who drink alcohol. Be sure to break out your champagne flutes or buy some plastic stemware at your local party store. These cute wine charms would be perfect to keep track of whose glass is whose. Bottles of sparkling juice and /or Champagne also make great Bunco prizes. Everyone brought their favorite appetizer or dessert. There were many delicious savory offerings like spinach artichoke dip, chips and salsa, egg rolls and jalapeno popper dip. My all time favorite dessert on New Year’s Eve is chocolate covered strawberries. Unfortunately strawberries are not in season during the winter but usually my grocery store carries a long stem variety in January and February. These are great for dipping. Chocolate fondue with assorted dippers is another perfect dessert for a crowd. Chocolate cake with a cake sparkler on top would be festive as well. What is your Bunco group’s favorite theme for games in January? Have you had a New Year’s theme Bunco? If so, let me know about it on The Bunco Game Shop Facebook page.